Author: John Mark, He was not one of the 12 disciples, but he accompanied Paul on his first missionary journey (Acts 13:13). Setting: The Roman Empire under Tiberius Caesar. The empire, with its common language and excellent transportation and communication systems, was ripe to hear Jesus' message, which spread quickly from nation to nation. Key verse: "For even the Son of Man came not to be served but to serve others and to give his life as a ransom for many" (10:45). 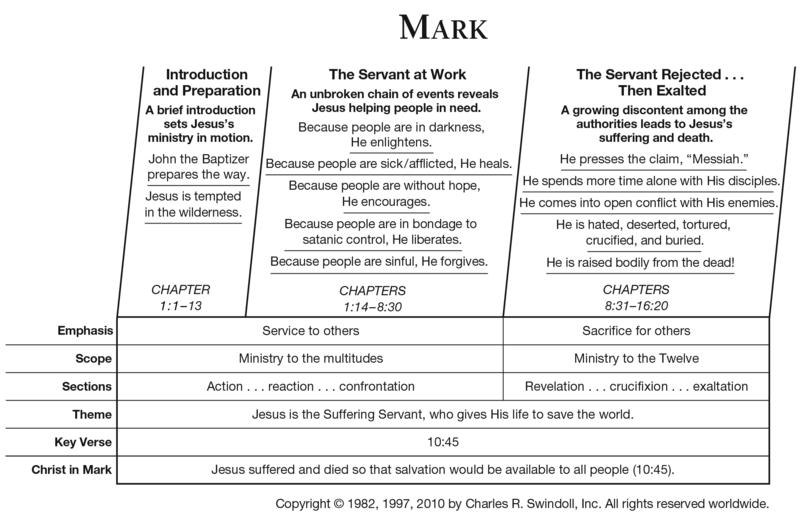 Special features: Mark was probably the first Gospel written. The other Gospels quote all but 31 verses of Mark. Mark records more miracles than does any other Gospel. A heathen god considered by the Jews to be the supreme evil spirit. In Roman mythology, the goddess of the moon, hunting, wild animals, and virginity. The Greek god of commerce, science, invention, cunning, eloquence, and theft. The Aramaic word for riches, personified by Jesus as a false god. National god of the Ammonites whose worship involved child sacrifice. An idol worshiped by Israel in the wilderness. In Greek mythology, the twin sons of Zeus. The supreme god of the ancient Greeks. Word in life study Bible . 1997, c1996 (electronic ed.) (Mr 3.31). Nashville: Thomas Nelson. Word in life study Bible . 1997, c1996 (electronic ed.) (Mr 8.11). Nashville: Thomas Nelson. Satan, or Adversary, is the most frequently used name for the devil in the N.T., appearing over fifty times. Devil, or slanderer, is used over thirty times. Satan, the personification of evil in this world, is the great superhuman enemy of God, his people, and all that is good. His character is vile and evil, and he is portrayed as the great deceiver. So sly is Satan in his deception that he sometimes transforms himself into an angel of light (2 Cor. 11:14). The following names or titles for Satan in the N.T. throw further light on the devil’s character. New Geneva study Bible. 1997, c1995 (electronic ed.) (Mr 1.21). Nashville: Thomas Nelson. On several occasions in the Gospel of mark Jesus tells someone not to tell, either who He is, or what they have seen that would demonstrate who He is. This is called the Messianic Secret. Why did Jesus want to keep his identity as Messiah a secret? • To avoid being considered just a “miracle worker.” Note that many of these commands follow miracles. Jesus did not want people to follow Him just to see Him do tricks. He came as the Son of God to ring salvation and forgiveness from sin, not just physical healing and miracles. • To avoid undue publicity which would hinder His mobility and ministry to His disciples. Note the result of the leper’s disobedience in 1:45. • To avoid the mistaken notion of the type of Messiah He came to be. He came to suffer and serve and sacrifice Himself, not simply to display His power (cf. 10:45). • To avoid the premature death that increased popularity could bring. New Geneva study Bible. 1997, c1995 (electronic ed.) (Mr 1.35). Nashville: Thomas Nelson. Luke 7:36-47 Strict group of religious Jews who advocated obedience to the most minute portions of the Jewish law and traditions. Very influential in the synagogues. Respect for the law, belief in the resurrection of the dead, committed to obeying God's will. Rejected Jesus' claim to be Messiah because he did not follow all their traditions and associated with notoriously wicked people. Wealthy, upper class, Jewish priestly party. Rejected the authority of the Bible beyond the five books of Moses. Profited from business in the Temple. They along with the Pharisees, were one of the two major parties of the Jewish high council. Showed great respect for the five books of Moses, as well as the sanctity of the Temple. Denied the resurrection of the dead. Thought the Temple could also be used as a place to transact business. Professional interpreters of the Law-who especially emphasized the traditions. Many teachers of religious law were Pharisees. Respect for the law. Committed to obeying God. Denied Jesus' authority to reinterpret the law. Rejected Jesus as Messiah because he did not obey all of their traditions. A Jewish political party of King Herod's supporters. Unknown. In the Gospel they tried to trap Jesus with questions and plotted to kill him. Afraid of Jesus causing political instability. They saw Jesus as a threat to their political future at a time when they were trying to regain from Rome some of their lost political power. A fiercely dedicated group of Jewish patriots determined to end Roman rule in Israel. Concerned about the future of Israel. Believed in the Messiah but did not recognize Jesus as the one sent by God. Believed that the Messiah must be a political leader who would deliver Israel from Roman occupation. Jewish monastic group practicing ritual purity and personal holiness. Emphasized justice, honesty, commitment. Believed ceremonial rituals made them righteous. 4:26-29 Story of the growing seed We must share the Good news of Jesus with other people, but only God makes it grow in their lives. 7:31-37 Jesus heals a deaf man who could hardly talk Jesus cares about our physical as well as spiritual needs. 8:22-26 Jesus heals the blind man at Bethsaida Jesus is considerate because he makes sure this man's sight is fully restored. A Roman soldier told Pilate that Jesus was dead. The Roman soldiers did not break Jesus' legs because he had already died, and one of them pierced Jesus' side with a spear. Joseph of Arimathea and Nicodemus wrapped Jesus' body and placed it in the tomb. The women made a mistake and went to the wrong tomb. Mary Magdalene and Mary the mother of Joseph saw Jesus placed in the tomb. On Sunday morning Peter and John also went to the same tomb. Unknown thieves stole Jesus' body. The tomb was sealed and guarded by Roman soldiers. The disciples stole Jesus' body. The disciples were ready to die for their faith. Stealing Jesus' body would have been admitting that faith was meaningless. If the religious leaders had taken Jesus' body, they would have produced it to stop the rumors of his resurrections. Jesus did not arrive unannounced or unexpected. The Old Testament prophets had clearly predicted the coming of a great one, sent by God himself, who would offer salvation and eternal peace to Israel and the entire world. Then came John the Baptist, who announced that the long-awaited Messiah had finally come and would soon be among the people. In God’s work in the world today, Jesus does not come unannounced or unexpected. Yet many still reject him. We have the witness of the Bible, but some choose to ignore it, just as many ignored John the Baptist in his day. Jesus had all the power of God; He raised the dead, gave sight to the blind, restored deformed bodies, and quieted stormy seas. But with all this power, Jesus came to humanity as a servant. We can use his life as a pattern for how to live today. As Jesus served God and others, so should we. Jesus came as a servant, so many did not recognize or acknowledge him as the Messiah. We must be careful that we don’t reject God or his will because he doesn’t quite fit our image of what God should be.